Custom operations are useable in processor systems for performing functions including multimedia functions. These custom operations enhance a system, such as PC system, to provide real-time multimedia capabilities while maintaining advantages of a special-purpose, embedded solution, i.e., low cost and chip count, and advantages of a general-purpose processor reprogramability. These custom operations work in a computer system which supplies input data having at least two operand data, performs operations on the operand data, and supplies result data to a destination register. 본 발명은 멀티미디어 기능을 포함하는 기능들을 실행하는 프로세서 시스템, 예를 들어 고품질의 비디오 및 오디오를 처리하여 특정화된 고기능의 오퍼레이션을 실행하는 능력을 갖춘 시스템에서 사용하기 위한 커스텀 오퍼레이션에 관한 것이다. The present invention relates to a custom operations for use in a system with the ability to execute a processor system, such as a high-performance operations characterized by processing a high-quality video and audio for executing functions including multimedia functions. 시스템은 다기능 PC 증강 수단으로서 기능하는 일반 목적 CPU와 추가 유니트를 포함하고 있다. The system includes a general purpose CPU and additional units to serve as a multi-function PC enhancement means. 커스텀, PC는 다표준 비디오 및 오디오 스트림을 처리하여야 하며, 유저는 가능하다면 압축 해제 및 압축을 원한다. Custom, PC is should be treated with standard video and audio streams, the user can, if you want to compress and decompress. PC에서 사용되는 CPU칩들은 저해상도의 실시간 비디오 압축을 하면서, 고품질의 비디오 압축 해제 및 압축은 가능하지가 않다. CPU chips used in PC are turned off, high quality video compression and real-time video compression, low resolution and compression is not is not possible. 또한 유저는 시스템의 반응능력을 회생하지 않고 시스템이 라이브 비디오 및 오디오를 제공할 것을 요구한다. In addition, the user is not required regeneration of the system's response capacity to the system to provide live video and audio. 일반 목적 및 내장된 마이크로프로세서를 근간으로한 응용에 있어서, 하이레벨의 언어로 프로그램밍하는 것이 바람직하다. For application as a basis for a general-purpose and embedded microprocessor, it is desirable to programming in a high level language. 최적 컴파일러와 단순 프로그래밍 모델을 효과적으로 지원하기 위해서는 선형 어드레스 포인터의 조종을 직접적으로 지원하는 대형의 선형 어드레스 공간, 일반 목적 레지스터, 레지스터와 레지스터간 오퍼레이션과 같은 어떤 마이크로프로세서 아키텍쳐 특징들을 필요로 한다. The compiler and optimally require any microprocessor architecture features such as inter-simple programming model to the linear addresses effectively support large to directly support the handling of a pointer to a linear address space, general-purpose register, the register and the register operation. 최근에 일반적으로 선택하는 마이크로프로세서 아키텍쳐는 현재 64 비트들과 128비트들 시스템이 개발중 이지만 32비트들 선형 어드레스, 32 비트들 레지스터, 32 비트들 정수 오퍼레이션이다. Microprocessor architecture recently common choice is to but of a current 64-bit and 128-bit system, the development of 32-bit linear addresses, 32-bit registers, 32-bit integer operations. 그러나, 많은 알고리즘으로 데이터 조정을 하기 위해서는 전체 비트들 수(즉, 32 비트들 시스템의 32 비트들)를 이용한 데이터 오퍼레이션은 고가의 실리콘 자원을 낭비하는 것이다. However, in order to adjust the data as many algorithms data operations using the entire number of bits (i.e., 32 bits of the 32-bit systems) is a waste of expensive silicon resources. MPEG 비디오 시스템의 압축 해제와 같은 중요한 멀티미디어 응용이 8비트들 데이터 항목을 다루는 대부분의 실행 시간을 소비하는 것이다. The major multimedia applications such as uncompressed video in the MPEG system will consume most of the running time dealing with 8-bit data items. 작은 데이터 항목을 조정하기 위해 32, 64, 128 비트들 오퍼레이션을 이용하면 구현 시 32, 64, 128 비트들 실행 하드웨어를 비효율적으로 이용하는 것이다. With 32, 64, or 128 bits, the operation to adjust a small data item to inefficient use of the hardware implementation of execution 32, 64, or 128 bits. 그러므로, 커스텀 오퍼레이션은 데이터 항목들을 동시에 오퍼레이션하여 적은 구현 비용으로 중요 요소에 의해 성능을 향상한다. Therefore, custom operations to the operation data items at the same time increase the performance by a significant factor with low implementation costs. 비록, 다른 수단을 통한 유사한 성능 증대가 달성될 수 있을 지라도, 예를 들어 주기당 커스텀의 마이크로프로세서 명령의 상위 넘버를 실행마면, 다른 수단은 저렴한 목표 응용을 위해 다른 수단은 일반적으로 고가인 것을 피한다. Although, avoids Although a similar performance increase through other means may be achieved, for example, run a higher number of custom per cycle Microprocessor mamyeon, other means and other means for low target application is typically a high-priced . 부가적으로, n 비트들의 작은 데이터 항목을 조정하기 위해서 m 비트들 오퍼레이션, 예를 들어 32 비트를 오퍼레이션을 이용하는 것은(여기서, n＜m이다), 구현시 m 비트들 오퍼레이션 하드웨어의 비효율적인 사용이다. Additionally, the use of m-bit, the operation, such as operation for 32-bit to adjust the small data items of n bits (where, n is a <m), the inefficient use of the implement when m bits operation Hardware . 종래의 DSP(디지털 신호 처리) 오퍼레이션은 모듈로값(modulo value)을 계산하고 있다. Conventional DSP (digital signal processing) operations is calculating a value (modulo value) to the module. 본 발명의 클립핑 또는 포화 오퍼레이션(saturation operation)은 레지스터의 물리적 한계를 초과하여 실행하는 데이터를 프로세싱이 발생하는 신호 처리 응용에서 특히 값어치가 있다. Clipping or saturation operation of the present invention (saturation operation) is particularly valuable in signal processing applications where the processing generates data that is running beyond the physical limits of the registers. 종래에는 이러한 상황이 일어나면 데이터는 물리적으로 이용 가능한 범위의 다른 끝에서 맵된다. Conventionally, such a situation occurs, data is map at the other end of the range used to physically. 신호 처리에 있어서, 이러한 주기적인 매핑은 위험할 수 있다. A signal processing, such periodic mapping can be dangerous. 예를 들면, 매우 작은 오디오 볼륨은 종래의 방법을 이용하여 최상위 끝에서 맵되어야 한다. For example, a very small volume, the audio shall be mapped at the top end by using a conventional method. 제어 응용 및 비디오/오디오 응용에 있어서 모듈로 값은 제어 범위나 세기 범위가 포화할 때 바람직하지 않다. A module in the control application and the video / audio applications value is not desirable when the control range or the saturation intensity range. 미국 특허 5,239,654로부터 단일 32 비트 명령 또는 다중 16 또는 18비트 명령들과 같은 어떤 명령들을 프로세서가 수행하는지를 제어하는 옵션들 레지스터를 갖는 프로세서가 공지된다. The processor, from United States Patent 5,239,654 having a options register that controls whether the processor performs certain instructions, such as a single 32-bit instruction or multiple 16-or 18-bit instruction is known. 이 프로세서가 가산과 같은 그러한 명령을 실행할 때, 명령은 프로세서가 32비트 가산과 같은 입력 레지스터의 컨텐츠상에 단일 32비트 오퍼레이션을 수행하거나, 동일 입력 레지스터의 컨텐츠상에 두 개의 16비트 오퍼레이션 또는 4개의 8비트 오퍼레이션들을 수행(두개의 16비트 가산, 또는 4개의 8비트 가산과 같음)하도록 제어한다. The processor when executing such a command, such as the addition, the command processor is a 32-bit adder and performs a single 32 bit operation on the content of the input register, or four two 16 bit operations or on the content of the same input register of the same controls the 8-bit operations to be performed (equal to two 16 bit additions, or four 8-bit addition). 본 출원은 1995년 9월 1일자로 출원된 미국 가출원 제 60/003,140호와 1995년 9월 25일자로 출원된 미국 가출원 제 60/004,642호의 이익을 청구한다. This application claims the benefit of U.S. Provisional Application No. favors 60 / 004,642, filed a US Provisional Application No. 60 / 003,140 and No. 25 September 1995 filed by 1st September 1995. 다음의 출원들이 VLIW 프로세싱 시스템을 설명하기 위해 여기서 참조 문헌으로 결합되어 있다. Next there are combined in the application by reference herein to describe the VLIW processing system. 발명의 명칭이 "VLIW Processor With Less Instruction Issue Slots Than Functional Units(기능 단위 보다 적은 명령 이슈 슬롯을 가진 VLIW 프로세서)"인 미국 특허 출원 제 07/998,080호", The title of the invention of U.S. Patent Application No. 07 / 998,080 "VLIW Processor With Less Than Instruction Issue Slots Functional Units (VLIW processor function with fewer instruction issue slots than the unit)" No. " 발명의 명칭이 클립핑 기능을 이용한 멀티미디어 어플리케이션의 커스텀 오퍼레이션 방법 및 장치와, 싱글 명령의 제어하에서 병렬 프로세싱하는 다중 오퍼랜드를 이용한 커스텀 오퍼레이션 방법 및 장치인 동시에 제출된 출원. And custom operation method and apparatus of the multimedia application name with the clipping feature of the invention, in the applications filed at the same time a custom operation method and apparatus using multiple operands for parallel processing under control of a single instruction. 도 1은 본 발명으로 사용하기 위한 예증 시스템의 블록도. 1 is a block diagram of an illustrative system for use with the present invention. 도 2는 CPU 레지스터 아키텍쳐의 일례를 도시하는 도면. Figure 2 is a view showing an example of a CPU register architecture. 도 3(a)은 메모리 매트릭스의 구성의 일례를 도시하는 도면. Figure 3 (a) is a view showing an example of the configuration of the memory matrix. 도 3(b)은 일례로서 실행될 태스크를 도시하는 도면. Figure 3 (b) is a diagram showing a task to be executed as an example. 도 4는 커스텀 오퍼레이션을 이용하는 바이트 전치 행렬(byte-matrix transposition)의 응용예를 도시하는 도면. Figure 4 is a view showing an application of the byte permutation matrix (byte-matrix transposition) using the custom operations. 도 5(a), 5(b)는 도 4에서 도시한 바이트 전치 행렬을 실행하기 위한 오퍼레이션 리스트를 도시하는 도면. Figure 5 (a), 5 (b) is a view showing a list of operations for executing the shown byte permutation matrix in FIG. 도 6은 dspiadd 오퍼레이션을 도시하는 도면. Figure 6 is a chart showing the operation dspiadd. 도 7은 dspuadd 오퍼레이션을 도시하는 도면. 7 is a chart showing the operation dspuadd. 도 8은 dspidualadd 오퍼레이션을 도시하는 도면. Figure 8 is a chart showing the operation dspidualadd. 도 9는 dspuguadaddui 오퍼레이션을 도시하는 도면. Figure 9 is a chart showing the operation dspuguadaddui. 도 10은 dspimul 오퍼레이션을 도시하는 도면. Figure 10 is a chart showing the operation dspimul. 도 11은 dspuml 오퍼레이션을 도시하는 도면. Figure 11 is a chart showing the operation dspuml. 도 12는 dspidualmul 오퍼레이션을 도시하는 도면. Figure 12 is a chart showing the operation dspidualmul. 도 13은 dspisub 오퍼레이션을 도시하는 도면. Figure 13 is a chart showing the operation dspisub. 도 14는 dspusub 오퍼레이션을 도시하는 도면. Figure 14 is a chart showing the operation dspusub. 도 15는 dspidualsub 오퍼레이션을 도시하는 도면. Figure 15 is a chart showing the operation dspidualsub. 도 16은 ifir16 오퍼레이션을 도시하는 도면. Figure 16 is a chart showing the operation ifir16. 도 17은 ifir8ii 오퍼레이션을 도시하는 도면. 17 is a view showing the operation ifir8ii. 도 18은 ifir8ui 오퍼레이션을 도시하는 도면. 18 is a view showing the operation ifir8ui. 도 19는 ufir16 오퍼레이션을 도시하는 도면. Figure 19 is a chart showing the operation ufir16. 도 20은 mergelsb 오퍼레이션을 도시하는 도면. Figure 20 is a chart showing the operation mergelsb. 도 21은 mergelsb 오퍼레이션을 도시하는 도면. Figure 21 is a chart showing the operation mergelsb. 도 22는 mergemsb 오퍼레이션을 도시하는 도면. Figure 22 is a chart showing the operation mergemsb. 도 23은 pack161sb 오퍼레이션을 도시하는 도면. Figure 23 is a chart showing the operation pack161sb. 도 24는 pack16msb 오퍼레이션을 도시하는 도면. 24 is a view showing the operation pack16msb. 도 25는 packbytes 오퍼레이션을 도시하는 도면. Figure 25 is a chart showing the operation packbytes. 도 26은 guadavg 오퍼레이션을 도시하는 도면. 26 is a view showing the operation guadavg. 도 27은 guadumulmsb 오퍼레이션을 도시하는 도면. 27 is a chart showing the operation guadumulmsb. 도 28은 ume8ii 오퍼레이션을 도시하는 도면. 28 is a view showing the operation ume8ii. 도 29는 ume8uu 오퍼레이션을 도시하는 도면. 29 is a chart showing the operation ume8uu. 도 30은 iclipi 오퍼레이션을 도시하는 도면. 30 is a view showing the operation iclipi. 도 31은 uclipi 오퍼레이션을 도시하는 도면. 31 is a chart showing the operation uclipi. 도 32는 uclipi 오퍼레이션을 도시하는 도면. 32 is a chart showing the operation uclipi. 본 발명은 특수 목적의 내장된 솔루션의 장점, 즉 저렴한 비용 및 칩 수의 장점과, 일반 목적 프로세서 재프로그램 능력의 장점들을 유지하면서 실시간 멀티미디어 능력을 제공하는 PC 시스템과 같은 시스템을 향상시키는 것입니다. The present invention is to maintain the advantages of the advantages of a built-in solution for a special purpose, ie the benefits of affordable cost and chips and general-purpose processor reprogramming capabilities enhance the system, such as a PC system that provides real-time multimedia capabilities. PC 응용에 있어서, 본 발명은 고정 기능의 멀티미디어 칩의 능력을 능가하는 것이다. In PC applications, the present invention surpasses the capabilities of fixed-function multimedia chips. 따라서, 본 발명의 목적은 저가로 고성능의 멀티미디어를 달성하는 것이다. Accordingly, it is an object of the invention is to achieve a high-performance multimedia at a low cost. 본 발명의 다른 목적은 응용들의 작은 커널(kernel)들에서 처리 속도를 증가시키는 것이다. Another object of the invention is to increase the processing speed in small kernels (kernel) of the application. 본 발명의 또 다른 목적은 과도한 바이트 조정 명령 수를 필요로 하지 않으면서 캐시/메모리 대역폭의 완전한 이점을 달성하는 것이다. Another object of the invention is to achieve the full benefits of server without requiring an excessive number of bytes adjust instruction cache / memory bandwidth. 본 발명의 또 다른 목적은 멀티미디어 응용의 성능을 향상하는 고기능 오퍼레이션을 제공하는 것이다. It is another object of the invention to provide a high-function operations to improve performance in multimedia applications. 본 발명의 또 다른 목적은 오퍼레이션 실행시 특정화된 비트들 실행 하드웨어를 효율적으로 이용하는 커스텀 오퍼레이션을 제공하는 것이다. A further object of the present invention is to provide custom operations using the specified bit execution hardware in operation during running efficiently. 본 발명의 또 다른 목적은 멀티미디어 응용과 같은 특수 응용에 맞추어진 커스텀 오퍼레이션을 제공하는 것이다. A further object of the present invention is to provide custom operations tailored to specific applications such as multimedia applications. 본 발명의 또 다른 목적은 단일 명령의 제어하에서 병렬 처리를 위한 복수 오퍼랜드를 저장하는 복수 오퍼랜드 레지스터를 이용하는 것이다. A further object of the present invention is the use of multiple operand registers storing multiple operands for parallel processing under control of a single instruction. 이는 특히, 샘플들이 8비트들이거나 16비트들인 오디오 및/또는 비디오 응용에서 바람직하다. This is particularly preferred from the samples of audio and / or video applications, which are 8 bits or 16 bits. 본 발명의 목적은 트렁크드 범위(truncated range)의 정확한 측면에서 오디오나 비디오 신호와 같은 수신 신호를 유지하기 위한 클립핑 오퍼레이션을 이용하는 것이다. An object of the present invention is to use a clipping operation to keep received signals, such as audio or video signal in the correct side of the trunk de range (truncated range). 본 발명은 커스텀의 PC를 위한 재프로그램 가능한 다목적 플러그인 카드에서 비디오폰과 같은 단일 목적의 저렴한 시스템에서 사용 가능하다. The present invention can be used in the low single-purpose systems, such as video phones in re-programmable multi-purpose plug-in cards for the custom of the PC. 또한, 본 발명은 MPEG-1, MPEG-2와 같은 대중적인 멀티미디어 표준을 손쉽게 구현하는 시스템에서 사용 가능하다. The present invention is also used by the system to easily implement the popular multimedia standards such as MPEG-1, MPEG-2. 그러나, 강력한 일반 목적 CPU에 입각한 본 발명의 방향은 개방형이거나 독점이든지 각종 멀티미디어 알고리즘을 구현할 수 있다. However, the direction of the present invention based on a powerful general-purpose CPU is, whether open or proprietary may implement a variety of multimedia algorithms. 소스 코드 레벨에서 소프트웨어 호환성을 정의하면 비용과 성능간의 최적 균형을 맞추기 위한 이점을 가진다. If you define a software compatibility at the source code level, it has the advantage to meet the optimum balance between cost and performance. 강력한 컴파일러는 비휴대용 어셈블러 프로그래밍에 의존할 필요가 없게 한다. Powerful compiler does not need to rely on non-portable assembler programming. 본 발명에 의하면 친숙한 기능 호출 신택스(a familiar function call syntax)로 개선된 DSP형 오퍼레이션으로 소스 코드로부터의 강력한 로우 레벨의 오퍼레이션이 이용 가능하다. The operation of a strong low level according to the present invention from the friendly function call syntax (a familiar function call syntax) to the DSP-type operation improvement in source code is available. 본 발명에 따른 컴퓨터 시스템은 청구항 1의 특징부에 의해 특징된다. The computer system according to the invention is characterized by the features of claim 1. 본 발명에 따른 컴퓨터 시스템은 제 1 및 제 2 명령을 둘 다 포함하는 명령 세트를 가지는 프로세서를 갖는 컴퓨터 시스템을 제공한다. The computer system according to the present invention provides a computer system having a processor with an instruction set that contains both a first and a second command. 재 1 명령은 프로세서가 전체적으로 입력 레지스터로부터 M비트 입력 데이터에 대한 오퍼레이션하도록 제어한다. Re first instruction controls the processor to the operation of the M-bit input data from the input register as a whole. 제 2 명령은 프로세서가 병렬적으로 각각 M비트 입력 데이터의 N비트들 상에(여기서 N＜M) Q 오퍼레이션들을 수행하도록 제어한다. Second instruction controls the processor to (where N <M) perform Q operations on the N bits of the M-bit input data in parallel. 제 1 및 제 2 명령은 프로세서가 이 방식으로 오퍼레이션하도록 항상 제어한다. First and second instruction always control the processor to operation in this manner. 그 결과 M비트 입력 데이터로부터 QN 비트 수(bit number)들 상에 또는 전체적으로 M비트 입력 데이터에 대한 오퍼레이션하도록 프로세서를 각각의 명령이 제어하는 지를 선택하기 위한 명령들을 실행하는 어떤 제어 비트들을 미리 설정할 필요가 없다. As a result, needs pre-setting certain control bits that executes instructions for selecting whether the processor to operations that each of the command and control for the QN-bit number M-bit input data on the (bit number) or as a whole from the M-bit input data no. 제 1 및 제 2 명령은 가산과 같은 산술적으로 동일 타입의 오퍼레이션에 대한 것일 수 있다. First and second instruction may be for arithmetically the same type of operations as such addition. 명령들의 실행은 클립핑(clipping) 또는 포화(saturation) 오퍼레이션을 포함할 수 있다. Execution of the instructions may include a clipping (clipping) or saturated (saturation) operation. 또한, 명령들은 병렬적으로 수행될 수 있다. In addition, the instructions may be performed in parallel. 본 발명의 또 다른 목적과 이점은 당업자라면 이후의 상세한 설명으로부터 용이하게 이해할 수 있을 것이다. It is another object and advantage of the present invention those skilled in the art will understand readily from the detailed description that follow. 본 발명을 실행하기 위한 최상의 모드가 단지 일실시예로서 도시되고 기술되었다. The best mode for practicing the invention have been shown and described only one embodiment. 본 발명의 다른 상이한 실시예들이 가능하며 본 발명의 범위를 일탈하지 않는 각종 변형이 가능하고 도면 및 설명은 본 발명의 일례이며 이에 한정되는 것은 아니다. Other different embodiments are possible, and various modifications are possible without departing from the scope of the present invention the drawings and description of the present invention is not an example of the present invention is not limited thereto. 이후, 본 발명의 보다 상세한 설명을 위해 첨부된 도면을 참조하여 설명하기로 한다. Then, with reference to the accompanying drawings for a more detailed description of the present invention will be described. 도 1은 본 발명과 함께 사용되는 시스템의 블록도이다. Figure 1 is a block diagram of a system used with the present invention. 상기 시스템은 마이크로프로세서, 동기적 동적(synchronous dynamic) RAM (SDRAM)과 입력되거나/및 출력되는 멀티미디어 데이터 스트림들에 대한 인터페이스하는 외부회로로 구성되어 있다. The system consists of an external circuit to interface to microprocessors, synchronous dynamic (synchronous dynamic) RAM (SDRAM) and a multimedia data stream that is input or / and output. 이 보기에서는, 32 비트들 CPU가 VLIW 프로세서 코어(processor core)를 형성한다. In this example, 32 bits, the CPU forms a VLIW processor core (processor core). CPU는 32비트들 선형 어드레스 공간(linear address space)과 128개의 일반용으로 사용되는 32비트들 레지스터들로 구성되어 있다. CPU is made up of the 32-bit linear address space (linear address space) and 128 32-bit general purpose registers used. 본 시스템에서는, 레지스터들이 뱅크들로(bank)분리되지 않는다. In this system, the registers are not separated into banks (bank). 대신에, 오퍼레이션은 어떠한 오퍼랜드 (operand)에 대해서 어떠한 레지스터를 사용할 수 있다. Alternatively, the operation can use any register for any operand (operand). 이 시스템에서는, CPU가 VLIW 명령-세트 구조를 사용하므로, 최대 5개의 오퍼레이션지시가 나오게된다. In this system, CPU is a VLIW instruction-set uses a structure, it is get to the maximum of 5 operations indicated. 이러한 오퍼레이션들은, 이 보기에서는, 정수 및 부동점 수학단위(floating-point arithmetic units)와 데이터-패러렐(data-parallel)dsp와 같은 단위들과 CPU내에 있는 27개의 기능단위들 중 5개를 가리키게 된다. These operations are, this view, integer and floating point math unit (floating-point arithmetic units) and data - is pointed to five of 27 functional units within the parallel (data-parallel) units such as dsp and CPU . 본 발명을 사용하는 CPU의 작업세트(operation set)는 표준 비디오 압축과 비압축(decompression) 알고리즘의 수행을 빨리 수행시키는 멀티미디어 작업 뿐만 아니라 마이크로프로세서 오퍼레이션들을 포함하고 있다. The working set of the CPU using the present invention (set operation), as well as to perform multimedia tasks performed in the standard video compression and non-compression (decompression) algorithm faster and comprise a microprocessor operation. 한 개의 특별한 또는"일반적인" 오퍼레이션은 단일한 명령으로 지시된 몇몇 오퍼레이션들 중 한 개인 오퍼레이션이다. One special or "normal" operation is one of the few operations in a single instruction, individual instruction operations. 이 보기에서는 5개의 오퍼레이션들이 최대 11개의 마이크로프로세서 오퍼레이션들을 수행할 수 있다. In this view it can be five operations to perform up to 11 microprocessor operation. VLIW, RISC 또는 다른 구조에서 수행되는 멀티미디어 오퍼레이션들은 멀티미디어 응용을 위해 엄청난 처리량(throughput)을 가져오게 된다. VLIW, RISC, or multimedia operations performed in other structures are led to a tremendous throughput (throughput) for the multimedia application. 본 발명은 이러한 멀티미디어 작업들을 수행하기 위하여, 32, 63,128,... 비트들로 된 한 개의 레지스터를 사용하고 있다. The present invention is to carry out such a multimedia work, and using a single register with the 32, 63 128, ... bits. 도 2는 CPU 레지스터 구조의 한 보기를 도시하고 있다. 2 shows a view of a CPU register architecture. 본 실시예의 CPU는 r0...r127로 표시된 128개의 일반목적용 32비트들 레지스터를 가지고 있다. Example CPU of this embodiment has a 128 of general purpose 32-bit registers denoted by r0 ... r127. 이 실시예에서는, 레지스터(r0,r1)들은 특수 목적을 위해 사용되며, r2에서 r127까지는 일반목적으로 사용되는 레지스터들이다. In this embodiment, the register (r0, r1) are used for special purposes, are the registers used by the general purpose r2 until r127. 본 시스템에서는, 프로세서가 한 클락주기 마다 항 개의 기다란 명령어를 출력한다. In this system, the processor outputs, wherein one long instruction every clock cycle one. 각각의 이러한 명령어는 몇 개의 오퍼레이션 내용들을 포함하고 있다. ( 본 실시예에서는 5개의 작업들) 각각의 오퍼레이션은 RISC 기계 명령어와 대응한다. Each such instruction includes several operations information (the five tasks in the present embodiment) each operation corresponds to a RISC machine instruction. 그 차이점은 오퍼레이션의 수행이 일반목적지 레지스터의 내용에 따라 수행된다는 점이다. The difference is that the performance of the operations being carried out in accordance with the contents of the general register destination. 레지스터에 있는 데이터는, 예를 들면, 정수표현 또는 부동점 표현형태로 되어 있다. The data in the register is, for example, is represented as an integer or floating point representation form. 본 실시예는 32 비트들 구조이므로, 멀티미디어 오퍼레이션에서 사용되는 데이터 값들에 대해서는 부동점 표현을 사용하지 않는다. This embodiment is a 32-bit structures, and does not use floating point representation for values ​​of data used in the multimedia operations. 그러나 64비트들,128비트들,...구조에 대해서는 부동점표현은 멀티미디어 오퍼레이션에서 사용되는 데이터 값들에 대해서 사용되어질 수 있다. However, 64 bits, 128 bits, ... floating-point representation for the structure can be used for the data values ​​used in the multimedia operations. 예를 들면, 단일 정확도를 표현하는 (32 비트들)IEEE-754 부동점 표현과/또는 2배 정확도를 표현하는(64비트들)IEEE-754 부동점 표현은 데이터 값들을 나타내는데 사용되어진다. For example, to express the single-precision (32-bits) (64-bit) IEEE-754 floating-point representation and / or expressing the double precision IEEE-754 floating-point representation is used to represent the data value. 본 발명의 구조에 있어서, 모든 오퍼레이션들은 선택적으로 "가드(guard)"되어진다. In the structure of the present invention, all operations are to be selectively be "guard (guard)". 가드된 오퍼레이션은 "가드" 레지스터(rguard)에 있는 값에 따라, 조건적으로 실행한다. The guard operation according to the values ​​in the "guard" register (rguard), is executed conditionally. 예를 들면, 가드된 정수 합산(iadd)은 다음과 같이 쓸 수 있다. For example, the guard integer summation (iadd) can be written as follows. 이 보기에서는, "if r23 then r14 := r14 + r10" 이다. 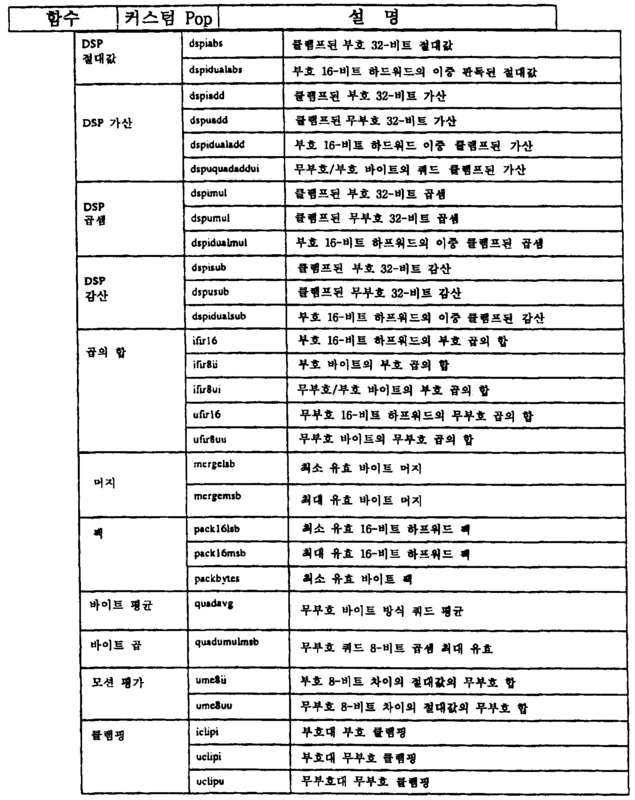 'if r23'은 r23내에 있는 LSB(Least Significant Bit)에 따라 TRUE 또는 FALSE를 판별한다. In this example,: the "if r23 then r14 = r14 + r10" . 'if r23 'will determine the TRUE or FALSE in accordance with (Least Significant Bit) in the LSB r23. r23의 LSB에 따라서, r23은 변하지 않거나, 또는 r14와 r10의 정수 합을 포함하도록 설정되어진다. Therefore, the LSB of r23, r23 is set to be include a sum, or, or an integer of r14 and r10 change. 예를 들면, 본 발명의 실시예에서는, 만약 LSB가 1로 평가가 되면, 목적지 레지스터(destination register: rdest), 이 예에서는 r13, 이 기록된다. For example, in the embodiment of the present invention, if the LSB is evaluated as 1, a destination register (destination register: rdest), in this example r13, is recorded. 가드(guarding)는 프로그래머가 볼 수 있는 시스템의 상태들, 즉 레지스터의 값들, 메모리 내용 그리고 장치 상태들에 관한 영향을 제어한다. Guard (guarding) controls the effect directed to the status of the system that the programmer can see, that the values ​​of the register, the memory content and device state. 본 발명에 있는 메모리는 바이트 어드레스가 가능하다(byte addressable). Memory in the present invention is the address byte (byte addressable). 부하들(loads)과 저장장치(stores)들은 자연적으로 정렬된다. The load (loads) and storage devices (stores) are naturally aligned. 즉 16비트들의 부하 또는 저장장치는 2의 배수인 어드레스를 처리하고 있다. I.e. the load or storage of 16 bits are processed to a multiple of the second address. 32 비트들의 부하 또는 저장장치는 4의 배수인 어드레스를 처리하고 있다. Load or storage of 32 bits are processed in a multiple of 4 address. 기술자들은 이러한 이론을 쉽게 수정할 수 있다. Engineers can easily modify these theories. 계산작업은 레지스터를 프로세싱하는 작업들(register-to-register operations)이다. Calculation is the process of (register-to-register operations) for processing the register. 특정 오퍼레이션은 한 개 도는 두 개의 소스(source) 레지스터에 대해 행해진다. The specific operation is performed for the two-source (source) to turn one register. 그리고 결과가 목적지 레지스터(rdest)에 입력된다. And the result is inputted to the destination register (rdest). 커스텀(custom) 작업들은 특별한 계산 작업들이며, 정상적인 계산작업들과 비슷하다. Custom (custom) tasks are deulyimyeo special calculations, it is similar to the normal calculations. 그러나 이러한 커스텀 오퍼레이션들은 멀티미디어 응용분야에 대해서 수행된다. However, these custom operations are performed on multimedia applications. 본 발명의 커스텀 작업들은 특수하며, 다른 응용 분야 뿐만 아니라 중요한멀티미디어 분야에서 성능을 대폭 개선시키기 위해 설계된 고기능의 오퍼레이션들이다. Special task of the present invention and are custom, high-performance operation are designed to dramatically improve performance, as well as other important applications in the multimedia field. 커스텀 오퍼레이션들이 응용 소스 코드(application source code)에 적절하게 포함되었을 때에, 본 발명은 필립스 전자회사에서 만든 Trimedia TM-1 칩과 같은 병렬 마이크로프로세서 이용할 수 있다. When custom operations have been included, as appropriate to the application source code (source code application), the present invention can be used in parallel, such as a microprocessor Trimedia TM-1 chips made by Philips Company. 일반 목적과 내장된 마이크로프로세서 응용을 위해, 고수준의 언어로 된 프로그래밍이 바람직하다. For microprocessors and general-purpose embedded applications, the high-level language programming is desirable. 최적의 컴파일러(optimizing compilers)와 단일한 프로그래밍 모델을 효과적으로 지원하기 위해, 크고 선형인 어드레스 공간, 일반 목적용 레지스터들과, 선형 어드레스 포인터(pointers)들의 제어를 직접 지원하는 레지스터 방식의 작업들과 같은 어떤 마이크로 프로세서 구조의 특징들이 필요하다. To support optimized compiler (optimizing compilers) and a single programming model for effective, large linear address space, general-purpose registers, and a linear address pointers (pointers) such as a register system operations that support direct control of It requires the features of any microprocessor architecture. 본 발명은 2개의 16 비트들 데이터 아이템(item)들 또는 4개의 8비트들 데이터 아이템들을 동시에 처리하기 위해서, 예를 들면, 32비트들 자원들(resources)과 같은 시스템 전체 자원들을 사용할 수 있다. The present invention can use the system-wide resources, such as two 16-bit data items (item) s or four 8-bit in order to process data items at the same time, e.g., 32-bit resources (resources). 이러한 자원들을 사용하게 되면, 단지 구현 비용을 약간만 증가시킴으로써, 주요 인자에 의한 성능(performance by significant factor)을 개선시킬 수 있다. The use of these resources, and can only be increased slightly by the implementation costs, improve performance (performance by significant factor) by a main factor. 게다가, 상기 과정은 표준 마이크로 프로세서 자원들을 근거로 하여 높은 실행속도를 얻게된다. In addition, the process is obtained a high running speed on the basis of a standard microprocessor resources. 몇몇 고기능의 커스텀 오퍼레이션들은 조건 브랜치(branches)들을 생략시킬 수 있다. Some high-function custom operations can be omitted, the conditional branch (branches). 상기 이론은 스케줄러(scheduler)가 TM-1 명령어를 갖고 있는 필립스 TM-1 칩과 같은 본 발명의 시스템의 각 명령어내에 있는 5개의 오퍼레이션 슬롯(slot)들을 효과적으로 사용할 수 있도록 도와준다. The theory of help to use a scheduler (scheduler) has five operation slots (slot) in the respective instructions of the system of the present invention, such as the Philips TM-1 chip with TM-1 instructions has effectively. 5개의 슬롯들을 모두 채우는 과정은 계산과정이 중요한 멀티미디어 응용분야의 내부 루프(inner loop)에서 중요하다.커스텀 오퍼레이션들은 본 발명이 가능한 가장 낮은 비용으로 매우 높은 멀티미디어 성능을 얻을 수 있도록 도와주고 있다. Filling in all of the five slots are important in the inner loop (inner loop) of multimedia applications are an important calculation fields. Custom operations are helping to achieve extremely high multimedia performance at the lowest possible cost is the present invention. 표 1은 본 발명의 커스텀 오퍼레이션들의 목록이다. Table 1 is a listing of custom operations of the present invention. 몇 가지 커스텀 오퍼레이션들은 각각의 오퍼랜드(operand)와 결과들이 서로 다른 몇몇 형태에서 존재한다. Some custom operations exist, each of the operand (operand) and the results are in several different forms. 서로 다른 므니모닉이나 또는 이름들이 할당될 수 있지만, 서로 다른 형태에 대한 므니모닉(mnemonics)은 적절한 오퍼레이션의 선택을 돕기 위해서, 각각의 처리과정을 명확히 해주고 있다. Although each can be different or moire mnemonics or names are assigned, to each other to help the moire mnemonic (mnemonics) is the selection of appropriate operation for the other form, the haejugo clarify the respective treatment process. 본 발명의 커스텀 오퍼레이션을 설명하기 위해서 한 가지 보기가 제시되어 있다. There is one view is presented to illustrate the custom operations of the present invention. 이 보기는 바이트-매트릭스(byte-matrix) 치환(transposition)이며, 커스텀 오퍼레이션들이 작은 커늘(kernel)내에서 처리속도를 크게 증가시키는 방법을 설명해주고 있다. This view bytes - a matrix (byte-matrix) substituted (transposition), there haejugo described a method for custom operations to significantly increase the processing speed in the small kernel (kernel). 커스텀 오퍼레이션들이 사용되는 대부분의 곳에서와 같이, 이 경우에서는 커스텀 오퍼레이션들의 성능은 병렬상태에 있는 많은 데이터 아이템들을 처리할 수 있는 능력으로 평가된다. As in most of the custom operations where they are used, in which case the performance of the custom operations are evaluated in the ability to process a number of data items in parallel state. 예를 들면, 메모리 내에 있는 모두 차 있고, 바이트로 된 4*4 매트릭스를 치환시키는 작업을 보기로 하자. For example, let's have both in the primary memory, view the work of replacing the 4 * 4 matrix in bytes. 매트릭스는 8비트들의 픽셀(pixel) 값들을 포함할 수 있다. The matrix may comprise a pixel (pixel) value of 8 bits. 도(3a)는 메모리 내에 있는 매트릭스의 구조를 도시하고 있으며, 도(3b)는 표준 수학적 표시로 수행될 작업을 도시하고 있다. Figure (3a) is shows a structure of a matrix in the memory, Fig. (3b) illustrates an operation to be performed by standard mathematical display. 전통적인 마이크로프로세서 명령어로 이 오퍼레이션을 수행시키는 과정은 다른 과정을 거치지 않고 바로 수행되는 직접적인 방법이나 시간이 소요된다. The process of performing this operation with traditional microprocessor instructions are straightforward method takes time and is performed directly without going through the different processes. 상기 오퍼레이션을 수행하는 방법은 바이트를 적재(load) 시키기 위해 12 개의 부하-바이트(load-byte) 명령어를 수행시킨다. Method for performing the operation of the load 12 in order to load a byte (load) - thereby perform a byte (load-byte) instruction. (왜냐하면, 16 바이트들 중 단지 12개만이 재배열될 필요가 있기 때문이다.) 그리고 그들의 새로운 위치들에 있는 메모리내에 바이트를 다시 저장시키기 위해서, 12 개의 저장-바이트 명령어들을 수행시킨다. (This is because it is necessary to be arranged in the material but only 12 of the 16 bytes.) In addition, 12 storage in order to store the bytes back in memory in their new position - thus performing byte instructions. 다른 방법은 4 개의 부하-단어 명령어들을 수행시키고, 적재된(loaded) 단어들의 바이트들을 레지스터 내에 재배열시키며, 4 개의 저장-단어 명령어들을 수행시킨다. Alternatively four load-sikimyeo rearrange perform word instruction and, in bytes of the stacked (loaded) into the register word, the four store-word instructions thereby performing. 불행하게도, 레지스터 내에 바이트들을 재배치시키는 일은 바이트들을 적절하게 이동시키고 마스크하기 위해서(shift and mask), 많은 명령어들을 요구하고 있다. Unfortunately, the work for rearranging the bytes in the register and the mobile as appropriate bytes and requires a number of commands (shift and mask), to mask. 24 개의 적재와 저장과정을 수행하는 과정은 적재/저장 장치내에 있는 이동과 마스킹 하드웨어를 사용하여, 더 짧은 명령 시퀀스(sequence)를 만들어낸다. The process of performing the load 24 and the storage process is to use the scroll and masking hardware in load / store unit, creating a shorter instruction sequence (sequence). 24 개의 적재/저장과정을 수행할 때의 문제점은 적재와 저장 과정들이 늦게 처리된다는 것이다. Problems when you perform 24 load / store process is that they load and save process later processing. 상기 과정들은 최소한 캐시(cache)와 메모리 서열( hierarchy)내에 있는 속도가 늦은 층(layers) 들을 엑세스해야 한다. The process must have a minimum speed in the cache (cache) and a memory sequence (hierarchy) must access the late layer (layers). 게다가 32 비트 워드 방식의 억세스가 빨리 진행이 될 때에, 바이트 적재와 저장과정을 수행하는 단계는 캐시/메모리 인터페이스(interface)의 기능을 사용하게 된다. In addition, when the access scheme of the 32-bit word to be conducted quickly, performing byte loads and stores process will use the functions of the cache / memory interface (interface). 지나치게 많은 바이트 처리 명령어를 요구하지 않으면서, 캐시/메모리 밴드폭을 최대한 활용하는 빠른 알고리즘(fast algorithm)이 바람직스럽다. If you do not ask too many stand-byte processing instructions, quick algorithm to get the most out of cache / memory bandwidth (fast algorithm) it is adorable preferred. 본 발명은 바이트들을 직접적으로 그리고 병렬형태로 합치며 (merge)(mergemsb, mergelsb), 16 비트들의 반어들(half-words)과 바이트들을 채우는(pack)(pack16msb, pack16lsb)명령어들을 가지고 있다. The present invention has a direct and said conforming to a parallel form (merge) (mergemsb, mergelsb), (pack) filling the irony of (half-words) and the bytes of the 16-bit (pack16msb, pack16lsb) instruction bytes. 이러한 명령어들 중 4개는 본 발명에 적용될 수 있으며, 바이트들을 단어들 내에 채우는 처리속도를 증가시킬 수 있게 된다. Four of these instructions it is possible to increase the processing speed of the filling can be applied to the present invention, the byte within the word. 도 4는 바이트 행렬 전위의 예에 대한 이 구조들의 응용을 예시한다. Figure 4 illustrates the application of the structure of an example of a byte matrix potential. 도 5(a)는 행렬 전위를 구현하기 위해 필요한 오퍼레이션 리스트를 도시한다. Figure 5 (a) shows a list of operations necessary to implement the matrix potential. 실제 명령으로 어셈블될 때, 이 커스텀의 오퍼레이션들은 예를 들어 한 명령에 다섯가지 오퍼레이션이 가능하도록 하는 종속관계만큼 단단히 패킷될 것이다. When assembled into actual instructions, these custom operations of the packet will be tightly as dependencies, which enables the five operations in a command, for example. 도 5(a)에서 로우 레벨 코드는 단지 예시 목적상 도시되었다. Even the low level codes in 5 (a) is shown only illustrative purposes. 도 5(a)에서 4개의 로드 워드 오퍼레이션이 연속하는 제 1 순열은 입력 행렬의 패킷 워드를 레지스터(r10,r1,r12, 및 r13)에 전달한다. Fig first permutation to in 5 (a) consecutive four word load operation transfers the packet words of the input matrix into a register (r10, r1, r12, and r13). 4개의 합병 오퍼레이션 (mergemsb와 mergelsb)의 제 2 순열은 레지스터(r14,r15,r16 및 r17)에 중간결과를 생성한다. A second permutation of four merge operations (mergemsb and mergelsb) produces intermediate results in registers (r14, r15, r16 and r17). 이때, 다음 4개 팩 오퍼레이션(pack16msb 와 pack16lsb)의 순열은 원래 오퍼랜드를 대처할 수 있거나 또는 또 다른 계산에 원래 행렬의 오퍼랜드를 필요로한다면 각 레지스터에 전위 행렬을 저장할 것이다(TM-1 최적 C 컴파일러는 이러한 분석을 자동적으로 실행할 수 있다). At this time, the permutation of the following four pack operations (pack16msb and pack16lsb) is, if required the operand of the original matrix in or to respond to the original operand or another calculation will store the potential matrix for each register (TM-1 optimum C compiler can be automatically run in this analysis). 본 예에서, 전위행렬은 각 레지스터(st32d), 레지스터(r18,r19,r20 및 r21)에 저장된다. In this example, the potential matrices are stored in respective registers (st32d), registers (r18, r19, r20 and r21). 마지막 4개의 스토어 워드 오퍼레이션은 메모리내 마지막 위치에 전위 행렬을 저장시킨다. The last four words store operation and stores a potential matrix for the last position in the memory. 그러므로, 본 발명의 커스텀 오퍼레이션을 이용한다면 바이트 행렬 전위는 4가지 워드 오퍼레이션과 4가지 스토어 워드 오퍼레이션(가능한 최소) 및 레지스터-레지스터 8가지 데이터 처리 오퍼레이션을 필요로 한다. Therefore, when using the custom operations of the present invention has four kinds of potentials byte matrix word operations and four store word operations (the minimum possible) and a register-register requires eight kinds of data processing operations. 도 5(b)는 동등한 C 언어 프래그먼트를 예시한다. Figure 5 (b) illustrates an equivalent C-language fragment. 24 로드와 스토어 바이트 명령을 이용하는 브루트 포스 코드에 관한 알고리즘을 근거로한 커스텀 오퍼레이션이 단지 본 예에서의 8가지 오퍼레이션에 대해서만 이점을 보이는 것 같지만, 실제로 그 이점은 보다 크다. But it seems to benefit only the load and store 24 bytes of eight kinds of operations in the bracket using the route command is a custom operation algorithms based on the code just force this example, the fact that the benefits are greater than. 먼저, 커스텀 오퍼레이션을 이용한다면, 메모리 검색 횟수는 24번에서 8번으로 감소된다. First, if you use a custom operation, memory retrieval times are reduced from 24 times to 8 times. 즉, 인수 3에 의해 감소된다. That is, it is reduced by a factor of 3. 메모리 검색이 레지스터-레지스터 오퍼레이션보다 느리므로 메모리 검색의 감소는 중요한 사항이다. Memory search register-register operation and the slower than reducing the memory search is important. 더욱이, TM-1마이크로 프로세서 하드웨어가 가지고 있는 기본 성능을 개발하기 위한 본 시스템(TM-1 시스템)의 컴파일 시스템 기능은 코드를 근거로 한 커스텀의 오퍼레이션에 의해 향상된다. Moreover, the compilation system functions of the TM-1 microprocessor present system (TM-1 system) to develop the basic performance in hardware have is enhanced by the custom operations of the code on the basis of. 구체적으로, 컴파일 시스템은 메모리 검색 횟수와 레지스터-레지스터 오퍼레이션 횟수와 균형을 맞출 때 코드의 최적 스케줄(배열)을 보다 쉽게 생성한다. Specifically, the compiling system memory searches the register-to easily create more optimal schedule (arrangement) of the code when the number comes to the register operation and balance. 일반적으로, 고성능 마이크로프로세서에서는 단일 주기에서 처리될 수 있는 메모리 검색의 횟수가 제한되어 있다. In general, the high-performance microprocessor, the number of search memory which can be processed in a single cycle is limited. 그 결과, 단지 메모리 검색만을 포함하는 코드의 긴 순열은 긴 TM-1명령에서 빈 오퍼레이션 슬롯을 초래하므로 하드웨어의 최대 성능이 낭비된다. As a result, only the permutation of the long code which includes only the memory search, so resulting in an empty operation slots in the long TM-1 command, the maximum performance of the hardware is wasted. 도시된 바와 같이, 이 예를 통해서 본 발명의 커스텀 오퍼레이션의 이용이 계산을 실행하는데 필요되는 절대적인 오퍼레이션 횟수를 감소시킬 수 있다는 것과 또한 각 CPU의 최대 성능을 충분히 활용하고자 하는 컴파일 시스템 제품 코드에 도움이 되다는 것을 알 수 있다. Help build system product code, in this example, to take full advantage of the custom operations Additionally, the maximum performance of the CPU of those that use is possible to reduce the absolute operation number of times required to perform the calculation of the present invention through the steps illustrated How you can see that. 예를 들어 완전 MPEG 비디오 디코딩 알고리즘을 위한 이러한 MPEG 영상 재생등과 같은 다른 응용과 작동 판단 커널은 비록 충분하지는 않더라도 본 발명의 커스텀 오퍼레이션을 이용함으로써 이로울 수 있다. For example, full MPEG MPEG these different applications and operating kernel determines, such as video playback, such as for video decoding algorithms can benefit by using the custom operations of the present invention, if not enough though. 본 발명은 표 1에 열거된 커스텀 오퍼레이션을 포함한다. The invention includes a custom operations listed in Table 1. 이들 커스텀 오퍼레이션의 각 오퍼레이션이 이하에서 구체적으로 나타난다. Each operation of these custom operations are shown below in detail. 아래에 주어진 기능 코드에서, 표준 심볼, 문장(syntax)등이 이용된다. In the function code given below, standard symbols, etc. are used, a sentence (syntax). 예를 들어, temp1과 temp2는 임시 레지스터를 나타낸다. For example, temp1 and temp2 represent temporary registers. 또한, 예에서 처럼, 기능 temp1← sign_ext16to32(rsrc1<15:0>)에서 temp1은 16내지 32비트들(부호 비트들 확장)로 확장되는 부호비트들(이 예에서, 15번째 비트들이다)에 의해 rsrc1레지스터의 15:0 비트들(비트들 0내지 15)과 함께 로드된다. 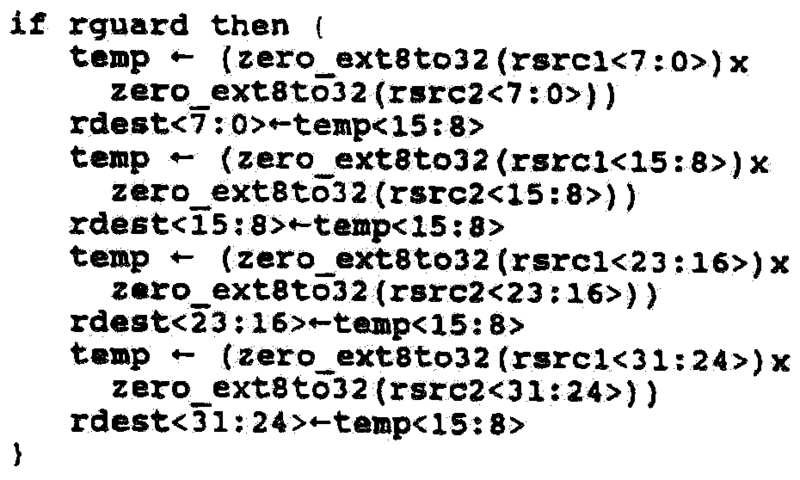 Further, as in the example, function temp1 ← sign_ext16to32 (rsrc1 <15: 0>) by at temp1 is the sign bit s is extended to 16 to 32 bits (sign bit of expansion) (in this example, are the 15-th bit) of the rsrc1 register 15: it is loaded with 0 bits (bits 0 to 15). 유사하게, temp2← sign_ext16to32(rsrc1<16:31>)은 rsrc1의 16번째부터 31번째 비트들이 추출되고(그리고 계산을 위하여 0내지 15번째 비트들에 배치된다), 그리고 이 예에서는 31번째 비트들인 부호비트들이 16번째 내지 32 번째 비트들로 부호 확장된다. Similarly, temp2 ← sign_ext16to32 (rsrc1 <16:31>) is (are disposed on and from 0 to 15-th bit to the calculation) from the 16-th 31-th bit rsrc1 are extracted, and in this example, which are 31-th bit code bits are sign extended to the 16th to the 32nd bit. 이 부호 확장은 이 예에서는 정수인 부호화된 값에 대해 이용된다. This sign extension is used for the integer encoded value in this example. 부호화되지 않은 값에 대해, 0이 채워진다. For an unsigned value, it filled with zero. 예를 들어, zero_ext8to32(rsrc1<15:0>)는 15내지 0비트들의 값이 이용되고 있고, 8내지 32번째 비트들은 0으로 채워졌다는 것을 의미한다. For example, zero_ext8to32 (rsrc1 <15: 0>) has been used, the value of bit 15 to 0, 8 to 32nd bits are filled with '0' means that jyeotdaneun. rsrc1,rsrc2와 rdest는 앞에서 기술된 바와 같이 이용 가능한 레지스터중 임의의 레지스터이다. rsrc1, rsrc2 and rdest is an arbitrary register of the available register as described above. 아래 열거된 각 오퍼레이션에 대해, 이 오퍼레이션은 rguard에 특정 guard를 선택적으로 취한다. For each operation enumerated below, the operation optionally takes a guard in a particular rguard. guard가 존재한다면, 이 예에서, LSB는 목적지 레지스터의 수정을 제어한다. If the guard is present, in this example, LSB controls modification of the destination register. 이 예에서, rguard의 LSB가 1이라면, 이 예에서, rdest가 기록되고, 그렇지 않으면, rdest는 변경되지 않는다. In this example, if you have the rguard LSB 1, if in this example, rdest is written, otherwise, rdest is not changed. dspiabs : dspiabs는 클립핑된 부호 절대 값 오퍼레이션, 즉 h_dspiabs에 대한 수우도-오피(pseudo-op)이다. dspiabs: dspiabs is suwoodo for clipped signed absolute value operation, i.e. h_dspiabs - is operational (pseudo-op). 이 오퍼레이션은 다음 기능을 갖는다. This operation has the following function. dspiabs 오퍼레이션은 스케줄러에 의해 일정한 제 1 배열의 0을 갖는 h_dspiabs로 변형된 수우도 오퍼레이션이며, 제 2 배열은 dspiabs배열과 같다. dspiabs operation is an operation suwoodo h_dspiabs transformed into a zero of a first constant array, by the scheduler, a second arrangement is shown in dspiabs array. 일반적으로 수우도 오퍼레이션은 어셈블리 소스 파일에 이용되지 않는다. Typically suwoodo operations is not utilized in the assembly source file. h_dspiabs는 동일 기능을 실행한다. :그러나, 이 오퍼레이션은 제 1 배열에서 처럼 0을 필요로 한다. h_dspiabs performs the same function. However, this operation requires a zero as in the first arrangement. dapiabs오퍼레이션은 rsrc1의 절대값을 계산하고, [2 31 -1...0]범위 또는 [0x7fffffff...O]로 상기 결과를 간략하게 하고, 그리고 rdest(목적지 레지스터)로이 축소된 값을 저장한다. dapiabs operation and calculates the absolute value of rsrc1, [2 31 -1 ... 0 ] range or [0x7fffffff ... O] to store values, and briefly, and rdest (a destination register) Roy reduced the result do. 모든 값들은 부호화된 정수이다. All values ​​are signed integer. dspidualabs : dspidualabs는 부호화된 16비트들 하드웨어 오퍼레이션 (h_dspidualabs에 대한 수우도-오피:하드웨어 dspidualabs)의 이중 클립핑 절대 값이다. dspidualabs: dspidualabs is a coded 16-bit hardware operations: - a dual clipped absolute value of (suwoodo for h_dspidualabs operational hardware dspidualabs). 이 오퍼레이션은 다음 기능을 갖는다. This operation has the following function. dspidualabs 오퍼레이션은 이 예에서, 제 1 변수로서 상수 0과 제 2 변수로서 dspidualabs 변수와 같이 스케쥴러에 의해 h_dspidualabs 로 변형되는 수도우 (pseudo) 오퍼레이션이다. dspidualabs operation in this example, may be transformed into h_dspidualabs by a scheduler such as dspidualabs variables as constants 0 and the second variable as a first variable Wu (pseudo) the operation. dspidualabs 오퍼레이션은 2개의 16비트들 클립핑된 부호 절대 값 계산을 rsrc1의 하이 및 로우 16비트들 하프워드에 관하여 각각 실행된다. Dspidualabs operation is executed with respect to each of two 16-bit clipped signed absolute value calculation to the high and low 16-bit halfwords of rsrc1 s. 2개의 절대값은 범위 [0x0..0x7fff]로 간략되고, 그리고 rdes의 대응 하프워드로 기록된다. The two absolute values ​​is simplified in the range [0x0..0x7fff], and is recorded in the corresponding half word of rdes. 모든 값들은 부호화된 16비트들 정수이다. All values ​​are coded 16-bit integer. h_dspidualabs는 동일 기능을 실행한다. : 그러나, 이 오퍼레이션은 제 1 배열에서 처럼 0을 필요로 한다. h_dspidualabs performs the same function. However, this operation requires a zero as in the first arrangement. 도 6에 도시된 바와 같이, dspiadd오퍼레이션은 부호화된 rsrc1+rsrc2의 합을 계산하여 32비트들 부호 범위[2 31 -1...-2 31 ] 또는 [0x7fffffff...0x8OOOOOOO]로 상기 결과를 간략하고 그리고 이 클립핑된 값을 rdest 에 저장한다. As shown in Figure 6, it dspiadd operation the result to calculate the sum of the coded rsrc1 + rsrc2 32 bits signed range [2 31 -1 ...- 2 31] or [0x7fffffff ... 0x8OOOOOOO] and brief, and stores the clipped value to rdest. 모든 값은 부호화된 정수이다. All values ​​are signed integer. 도 7에 도시된 바와 같이, dspuadd오퍼레이션은 부호화된 rsrc1+rsrc2의 합을 계산하여 32비트들 부호 범위[2 32 -1...0] 또는 [0xffffffff...O]로 상기 결과를 간략하고 그리고 이 클립핑된 값을 rdest 에 저장한다. As shown in Figure 7, dspuadd operation by calculating the sum of the coded rsrc1 + rsrc2 into 32 bits signed range [2 32 -1 ... 0] or [0xffffffff ... O] and the simplified results and stores the clipped value to rdest. dspidualadd : dspidualadd는 부호화된 16비트들 하드웨어 오퍼레이션의 이중클립핑 가산이다. dspidualadd: dspidualadd is a dual clipped addition of a coded 16-bit hardware operations. 이 오퍼레이션은 다음 기능을 갖는다. This operation has the following function. 도 8에 도시된 바와 같이, dspidualadd 오퍼레이션은 2개의 16비트들 클립핑된 부호 합계산을 rsrc1과 rsrc2의 하이 및 로우 16비트들 하프워드의 각 쌍에 관하여 각각 실행된다. 8, the operation is dspidualadd were run with respect to the two 16-bit clipped signed sum rsrc1 acid in the high and low 16-bit of each pair of half word of rsrc2. 2가지 합은 범위 [2 15 -1...2 15 ] [0x7fff...0x8OOO]로 간략되고, 그리고 rdest의 대응 하프워드로 기록된다. Two kinds of the sum is in the range [2 15 -1 ... 2 15] [0x7fff ... 0x8OOO] is a brief, and is written into corresponding halfwords of rdest. 모든 값들은 부호화된 16비트들 정수이다. All values ​​are coded 16-bit integer. dspuguadaddui : dspuguadadui는 부호화되지 않은 바이트, 그리고 부호화된 바이트 오퍼레이션의 이중 클립핑 가산이다. dspuguadaddui: dspuguadadui is unsigned byte, and the double clipped addition of an encoded byte-operational. 이 오퍼레이션은 다음 기능을 갖는다. This operation has the following function. 도 9에 도시된 바와 같이, dspuguadadui 오퍼레이션은 rsrc1과 rsrc2의 대응 8비트들 바이트의 4개의 각 쌍의 각 합을 4번 실행한다. As shown in Figure 9, dspuguadadui operation is carried out for each sum of rsrc1 and rsrc2 corresponding 8 bits of the four bytes of each pair of four times. rsrc1에서 바이트는 부호화되지 않은 값으로 간주된다. : rsrc2에서 바이트는 부호화된 값으로 간주된다. Byte from rsrc1 is considered to be unsigned values: bytes from rsrc2 are considered as a coded value. 4번의 합은 부호화되지 않은 범위 [255...0] 또는 [0xff...O]로 간략된다. : 그러므로, 바이트 합의 결과는 부호화되지 않는다. 4 is simplified to a single sum that is not encoded in the range [255 ... 0] or [0xff ... O]:. Thus, byte agreed result is not encoded. 모든 계산은 정확하게 계산된다. All calculations are accurately calculated. 도 10에 도시된 바와 같이, dspimul 오퍼레이션은 곱 rsrc1x rsrc2를 계산하고, 그 결과를 범위[2 31 -1...-2 31 ] 또는 [0×7fffffff...0×8OOOOOOO]으로 제한하며, 상기 제한된 값을 rdest에 저장시킨다. As shown in Figure 10, dspimul operation multiplies the calculation rsrc1x rsrc2, and the limit results to a range [2 31 -1 ...- 2 31] or [0 × 7fffffff ... 0 × 8OOOOOOO ] , and and it stores the limited value in rdest. 모든 값은 부호 정수이다. All values ​​are unsigned integers. 도 11에 도시된 바와 같이, dspumu1 오퍼레이션은 부호없는 곱 rsrc1×rsrc2을 계산하고, 그 결과를 부호없는 범위 [2 31 -1...0] 또는 [0×ffffffff]로 제한하며, 제한된 값을 rdest에 저장시키다. As shown in Figure 11, dspumu1 operation calculates a product rsrc1 × rsrc2 unsigned, limiting the result to an unsigned range [2 31 -1 ... 0] or [0 × ffffffff], the limited value train stored in rdest. dspidualmul : dspidualmul은 부호 16비트들 하프워드 오퍼레이션의 이중 제한된 곱셈이다. dspidualmul: dspidualmul is a double limited multiplication of signed 16-bit halfwords of operation. 도 12에 도시된 바와 같이, dspidualmul 오퍼레이션은 rsrc1과 rsrc2의 2개의 하이 및 로우 16비트들 하프워드쌍상에 독립적으로 부호 곱으로 제한된 2개의 16비트들을 계산한다. As shown in Figure 12, dspidualmul operation computes two high and low 16-bit halfwords of ssangsang independently as two 16-bit signed multiplication limited to rsrc1 and rsrc2. 2개의 곱은 범위 [2 15 -1...-2 15 ] 또는 범위[0×7fff...0×8OOO]으로 제한되며, rdest의 대응하는 하프워드에 기입된다. Two product of range [2 15 -1 ...- 2 15] or the range is limited to [0 × 7fff ... 0 × 8OOO ], is written into corresponding halfwords of rdest to. 모든 값은 부호 16비트들 정수이다. All values ​​are signed 16-bit integer. dspisub : dspisub는 제한된 부호 감산 오퍼레이션이다. dspisub: dspisub is limited code subtraction operations. 상기 오퍼레이션은 다음의 함수를 갖는다. The operation has the following function. 도 13에 도시된 바와 같이, dspisub 오퍼레이션은 차분 rsrc1-rsrc2를 계산하고, 그 결과를 범위 [0×8OOOOOOO...0×7fffffff]로 제한하며, 제한된 값을 rdest에 저장시킨다. As shown in Figure 13, dspisub operation calculates a difference rsrc1-rsrc2, and limits the result within the range [0 × 8OOOOOOO ... 0 × 7fffffff], and stores the limited value in rdest. 모든 값은 부호 정수이다. All values ​​are unsigned integers. 도 14에 도시된 바와 같이, dspusub 오퍼레이션은 부호없는 차분 rsrc1-rsrc2를 계산하고, 그 결과를 부호화되지 않은 범위[0.0×ffffffff]로 제한하며, 상기 제한된 값을 rdest에 저장시킨다. As shown in Figure 14, dspusub operation calculates a difference rsrc1-rsrc2 unsigned and, limited to the range of the non-coding result [0.0 × ffffffff], and stores the limited value in rdest. 도 15에 도시된 바와 같이, dspidualsub 오퍼레이션은 rsrc1과 rsrc2의 2개의 하이 및 로우 16비트들 하프워드 쌍상에 독립적으로 부호 차분으로 제한된 2개의 16비트들을 계산한다. As shown in Figure 15, dspidualsub operation computes two high and low 16-bit halfwords of ssangsang independently as two 16-bit signed difference limited to rsrc1 and rsrc2. 2개의 차분은 범위 [2 15 -1...-2 15 ] 또는 범위[0×7fff...0×8OOO]으로 제한되며, rdest의 대응하는 하프워드에 기입된다. Two differential is in the range [2 15 -1 ...- 2 15] or the range is limited to [0 × 7fff ... 0 × 8OOO ], it is written into corresponding halfwords of rdest to. 모든 값은 부호 16비트들 정수이다. All values ​​are signed 16-bit integer. 도 16에 도시된 바와 같이, ifir16 오퍼레이션은 rsrc1과 rsrc2의 대응하는 2개의 16비트들 하프워드쌍 각각의 2개의 독립된 곱을 계산하고, 상기 2개의 곱은 합해지며, 그 결과는 rdest에 기입된다. As shown in Figure 16, ifir16 operation calculates two 16 bit half-word pair in each of two independent product of a corresponding one of rsrc1 and rsrc2, and becomes combined product of the two, and the result is written to rdest. 따라서, 곱 및 곱의 최종 합계는 부호가 달린다. Thus, the final sum of the products and the product is run the code. 모든 계산은 오차없이 수행된다. All calculations are carried out without error. 도 17에 도시된 바와 같이, ifir8ii는 rsrc1과 rsrc2의 4개의 대응하는 8비트들 바이트쌍 각각의 4개의 독립된 곱을 계산한다. As shown in Figure 17, ifir8ii calculates four corresponding 8-bit bytes in each pair of four independent product that of rsrc1 and rsrc2. 4개의 곱은 합산되며, 그 결과는 rdset에 기입된다. And summing the four multiplication, and the result is written to the rdset. 모든 값이 부호있다고 가정하면, 이에 따라 곱 및 곱의 최종 합은 부호가 달린다. Assuming that all code values, whereby the sum of the final product and the product runs along the sign. 모든 계산은 오차없이 수행된다. All calculations are carried out without error. 도 18에 도시된 바와 같이, ifir8ui 오퍼레이션은 rsrc1과 rsrc2의 4개의 대응하는 8비트들 바이트쌍 각각의 4개의 독립된 곱을 계산한다. As shown in Figure 18, the operation calculates ifir8ui rsrc1 and four corresponding 8-bit bytes in each pair of four separate product to the rsrc2. 4개의 곱은 합산되며, 그 결과는 rdset에 기입된다. And summing the four multiplication, and the result is written to the rdset. rsrc2에서의 바이트가 부호없는 것이라고 가정하고, rsrc2에서의 바이트가 부호달린다고 가정하면, 이에 따라 곱 및 곱의 최종 합은 부호가 달린다. Assuming that the number of bytes in a bytes at home rsrc2 would not sign, and rsrc2 with sign, so the final sum of the product and the product runs along the sign. 모든 계산은 오차없이 수행된다. All calculations are carried out without error. 도 19에 도시된 바와 같이, ufir16 오퍼레이션은 rsrc1과 rsrc2의 2개의 대응하는 16비트들 하프워드쌍 각각의 2개의 독립된 곱을 계산하고, 2개의 곱은 합산되며, 그 결과는 rdest에 기입된다. As shown in Figure 19, the operation calculates ufir16 rsrc1 and two corresponding two independent product of each 16-bit half word of the pair and rsrc2, the two multiplication and summation, and the result is written to rdest. 모든 하프워드가 부호없다고 가정하면, 이에 따라 곱 및 곱의 최종 합은 부호가 없다. Assuming that all of the half word code, this is not a sign the final sum of the product and the product accordingly. 모든 계산은 오차없이 수행된다. All calculations are carried out without error. 곱의 최종 합은 rdest에 기입되기 전에 범위 [0×ffffffff...O]으로 제한된다. The final sum of products is limited to the range [0 × ffffffff ... O] before it is written to rdest. 도 20에 도시된 바와 같이, ufir8uu 오퍼레이션은 rsrc1과 rsrc2의 4개의 대응하는 8비트들 바이트쌍 각각의 2개의 독립된 곱을 계산하고, 4개의 곱은 합산되며, 그 결과는 rdest에 기입된다. As shown in Figure 20, ufir8uu operation calculates a product of each of two independent rsrc1 and four corresponding 8 bits of byte pairs and rsrc2, and summing the four multiplication, and the result is written to rdest. 모든 바이트는 부호가 없다고 가정하면, 모든 계산은 오차없이 수행된다. All bytes are assuming that there is no signed, all calculations are performed without error. 도 21에 도시된 바와 같이, mergelsb 오퍼레이션은 인수 rsrc1과 rsrc2로부터 rdest에 2개의 최하위 바이트쌍 각각을 인터리브한다. As shown in Figure 21, mergelsb operation interleaves the two respective pairs of least significant bytes from arguments rsrc1 and rsrc2 to rdest. rsrc2로부터의 최하위 바이트는 rdest의 최하위 바이트에 팩되고, rsrc1으로부터의 최하위 바이트는 제 2 최하위 바이트 또는 rdest에 팩되고, rsrc2로부터의 제 2 최하위 바이트는 rdest의 제 2 최상위 바이트에 팩되고, rsrc1으로부터의 제 2 최하위 바이트는 rdest의 최상위 바이트에 팩된다. The least significant byte from rsrc2 is pack in the least significant byte of rdest, the least significant byte from rsrc1 is pack to a second least significant byte or rdest, the second least significant byte from rsrc2 is pack to the second most significant byte of rdest, from rsrc1 the second least significant byte of the pack is the most significant byte of rdest. 도 22에 도시된 바와 같이, mergemsb 오퍼레이션은 인수 rsrc1과 rsrc2로부터의 2개의 최상위 바이트쌍 각각을 rdest에 인터리브한다. As shown in Figure 22, mergemsb operations are interleaved in rdest the two most significant bytes from arguments rsrc1 and rsrc2 each pair. rsrc2로부터의 제 2 최상위 바이트는 rdest의 최하위 바이트에 팩되고, rsrc1으로부터의 제 2 최상위 바이트는 제 2 최하위 바이트 또는 rdest에 팩되고, rsrc2로부터의 최상위 바이트는 rdest의 제 2 최상위 바이트에 팩되고, rsrc1으로부터의 최상위 바이트는 rdest의 최상위 바이트에 팩된다. The second most significant byte from rsrc2 is pack in the least significant byte of rdest, the second most significant byte from rsrc1 is pack to a second least significant byte or rdest, the most significant byte from rsrc2 is pack to the second most significant byte of rdest, the most significant byte from rsrc1 Pack is the most significant byte of rdest. 도 23에 도시된 바와 같이, pack16lsb 오퍼레이션은 인자 rsrc1과 rsrc2에서 rdest로의 2개의 최하위 하프워드를 저장한다. As shown in Figure 23, pack16lsb operation stores the two least significant half word to rdest factor in rsrc1 and rsrc2. rsrc1으로부터의 하프워드는 rdest의 최상위 하프워드에 저장되고, rsrc2로부터의 하프워드는 최하위 하프워드 또는 rdest에 저장된다. Halfword from rsrc1 is stored in the most significant halfword of rdest, halfword from rsrc2 is stored in the least significant halfword or rdest. 도 13에 도시된 바와 같이, pack16msb 오퍼레이션은 두 각각의 최상위 하프워드를 독립변수 rsrc1과 rsrc2에서 rdest로 저장한다. As shown in Figure 13, pack16msb operation stores the two respective most significant half word as independent variables rsrc1 and rsrc2 in rdest. rsrc1에서의 하프워드는 rdest의 최상위 하프워드로 저장되고 rsrc2에서의 하프워드는 rdest의 최하위 하프워드로 저장된다. Half a word is stored in rsrc1 to the top half of words rdest and half word in rsrc2 is stored in the least significant halfword of rdest. 도 25에 도시한 바와 같이 packbytes 오퍼레이션은 두 각각의 최하위 바이트를 독립변수 rsrc1과 rsrc2에서 rdest로 저장한다. And as shown in Fig. 25 packbytes operation stores the two respective least significant byte argument rsrc1 and rsrc2 in rdest. rsrc1에서의 바이트는 rsrc1의 제2-하위 바이트로 팩되고 rsrc2에서의 바이트는 rdest의 최하위 바이트로 저장된다. Bytes in rsrc1 is to pack the 2 low-order byte of rsrc1 bytes in rsrc2 is stored in the least significant byte of rdest. rdest의 두 최상위 바이트는 zero로 채워진다. Two of the most significant byte rdest is filled with zero. 도 26에 도시한 바와 같이, quadavg 오퍼레이션은 rsrc1과 rsrc2의 8-비트들 바이트에 대응하는 네개의 각각의 쌍의 네개의 분리 평균을 계산한다. As shown in Figure 26, quadavg operation computes four separate average of four respective pairs of corresponding 8-bit bytes of rsrc1 and rsrc2. 전체 바이트는 부호없는된 것으로 간주한다. Total bytes is considered to be unsigned. 각 평균의 최하위 8비트들은 rdest의 해당 바이트에 기록된다. The least significant 8 bits of each average are written to the corresponding byte in rdest. 도 27에 도시한 바와 같이, quadumulmsb 오퍼레이션은 rsrc1과 rsrc2의 8-비트들 바이트에 대응하는 네개의 각 쌍의 네 분리 곱을 계산한다. As shown in Figure 27, quadumulmsb operation computes four separate multiplication of each of the four pairs of corresponding 8-bit bytes of rsrc1 and rsrc2. 전체 바이트는 부호없는된 것으로 간주된다. Full bytes are considered unsigned. 각 16-비트들 곱의 최하위 8 비트들은 rdest의 해당 바이트에 기록된다. The least significant 8 bits of each 16-bit product are recorded in the corresponding byte in rdest. 도 28에 도시한 바와 같이, ume8ii 오퍼레이션은 rsrc1과 rsrc2의 부호 8-비트들 바이트에 대응하는 네개의 각 쌍의 네 분리 차분을 계산하고, 네 차의 절대값을 합하고, 그 합을 rdest에 기록한다. As shown in Figure 28, the operation calculates the ume8ii four separate differences of four respective pairs of corresponding signed 8-bit bytes of rsrc1 and rsrc2, and combine the absolute value of your car, record the sum to rdest do. 전 계산은 정확도의 손실 없이 실행된다. All calculations are carried out without any loss of accuracy. 도 29에 도시한 바와 같이, ume8uu 오퍼레이션은 rsrc1과 rsrc2의 부호없는 8-비트들 바이트에 대응하는 네개의 각 쌍의 네 분리 차분를 계산한다. As shown in Figure 29, ume8uu operation computes four separate chabunreul of four respective pairs of corresponding 8-bit bytes of rsrc1 and rsrc2 unsigned. 네 차분의 절대값들이 합해지고 그 합은 rdest에 기록된다. The absolute values ​​of the four differences are summed and the sum is written to rdest. 전체 계산은 정확도의 손실 없이 실행된다. Full calculations are carried out without any loss of accuracy. iclipi 오퍼레이션은 부호없는 정수 범위 (-rsrc2-1)로 클리프된 rsrc1의 값을 rsrc2로 복귀한다. iclipi operation returns the value of a as an integer range Cliffs (-rsrc2-1) unsigned rsrc1 to rsrc2. 독립변수 rsrc1은 부호 정수로 간주되고; Argument rsrc1 is considered a signed integer; rsrc2는 부호없는 된 정수로 간주되고 0과 0x7fffffff사이의 값을 가져야 한다. 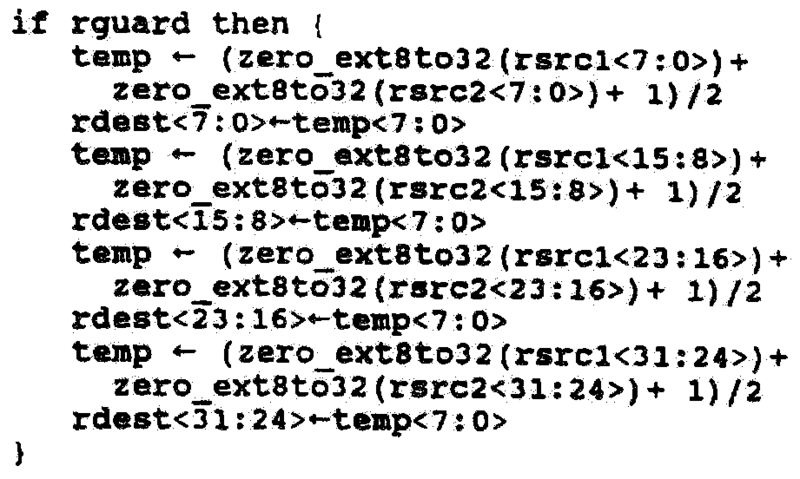 rsrc2 is considered an unsigned integer and must have a value between 0 and 0x7fffffff. uclipi 오퍼레이션은 부호없는 정수 범위 0으로 클리프된 rsrc1의 값을 rsrc2로 복귀한다. uclipi operation returns a value of rsrc1 Cliffs as an unsigned integer range 0 to rsrc2. 독립변수 rsrc1은 부호없는 정수로 간주되고; Argument rsrc1 is considered an unsigned integer; rsrc2는 부호없는 정수로 간주된다. rsrc2 are regarded as an unsigned integer. uclipu 오퍼레이션은 미표신 정수 범위 0으로 클리프된 rsrc1의 값을 rsrc2로 복귀한다. uclipu operation returns a value of rsrc1 Cliffs in US pyosin integer range 0 to rsrc2. 독립변수 rsrc1과 rsrc2는 부호없는 정수로 간주된다. Arguments rsrc1 and rsrc2 are considered unsigned integers. 상기 커스텀 멀티미디어 오퍼레이션을 사용함으로써, 상기 응용은 낮은 비용으로 멀티미디어 기능을 갖는 고 병렬식 마이크로프로세서를 구현하는 이점을 갖는다. By using the above custom multimedia operations, the application is high with multimedia functions with low cost has the advantage of implementing a parallel microprocessor. 상기 명세에서, 본 발명이 VLIW와 RISC와 슈퍼 스칼라 등의 명령 서식을 사용하는 많은 고 병렬식 마이크로프로세서 구현에 사용될 수 있다는 것을 확실히 이해할 것이다. In the above specification, it will certainly be appreciated that the invention may be used in many implementations and parallel microprocessors that use VLIW and Superscalar RISC and the like of the instruction format. 부가적으로, 기술에 있어 숙련된 사람은 상기 개념에 기초한 부가적 오퍼레이션을 쉽게 추가할 수 있다. Additionally, in the technique skilled person can add additional operations based on the concept easily. 예를 들어, 바이트의 쿼드 클리프된 감산은 특별히 설명하지 않는다. For example, quad Cliffs the subtracted number of bytes is not specifically described. 하지만, 확실히 기술에 있어 숙련된 사람은 상기 명세에 기초한 이 오퍼레이션을 쉽게 발전시킬 수 있다. However, it is certainly a skilled technical person has based on the specification can be easily develop operations. 멀티미디어 기능을 실행하는데 사용하기 위해 커스텀 오퍼레이션의 시스템과 방법을 적절히 설명하였다. A system and method for custom operations for use in running the multimedia function was properly described. 본 명세에서, 본 발명의 우선의 실시예만을 도시하고 설명한다. In the present specification, only the first embodiment of the present invention will be shown and described. 하지만 전술한 바와 같이, 본 발명은 다양한 또 다른 조합과 환경에 사용할 수 있고 여기에 표현된 바의 발명 개념의 의도 내에서 바꾸고 변경하는 것이 가능하다. However, as described above, the present invention can be changed to change within the intent of the invention concept of the represented bars here can be used in various other combinations and environments. 상기 제 1 명령은 실행될 때 상기 프로세서가 상기 입력 데이터의 상기 제 1 오퍼랜드 데이터에 대해 상기 오퍼레이션을 수행하여 M비트들을 포함하는 제 1 결과 데이터를 생성하도록 제어하고, 상기 제 2 명령은 실행될 때 상기 프로세서가 병렬적으로 상기 입력 데이터의 상기 제 2 오퍼랜드 데이터에 대해 Q 오퍼레이션들을 수행하도록 항상 제어하는 것을 특징으로 하는 컴퓨터 시스템. The first instruction which when executed the processor to perform the operation for the first operand data of the input data to the control to generate a first result data containing M bits, said second instruction, when executed the processor the parallel computer system characterized in that the control always to perform Q operations on the second operand data of the input data. 상기 제 1 및 제 2 명령들의 제어하에 수행되는 오퍼레이션들은 다른 수의 비트들을 포함하는 오퍼랜드들에 대해 실행되는 것을 제외하고 산술적으로 동일한 오퍼레이션들인, 컴퓨터 시스템. The first and second operations are performed under control of the instructions and arithmetic operations, which are the same, except that the computer system that runs on the operands, including the bits of the other number. 상기 Q 오퍼레이션들은 클립핑(clipping)을 포함하는, 컴퓨터 시스템. Wherein the Q operations are, the computer system including a clipping (clipping). 상기 목적지 레지스터는 상기 개개의 클립핑된 결과들을 함께 저장하는, 컴퓨터 시스템. The destination register, the computer system storing with the clipped result of the individual. 상기 프로세서는 상기 최상위 비트들의 최상위 비트들(mmsb)을 상기 목적지 레지스터의 최상위 비트들로서 저장하는 저장수단을 포함하고, 상기 저장 수단은 또다른 오퍼랜드 데이터의 최상위 비트들의 최상위 비트들을 상기 목적지 레지스터의 다음 최상위 비트들로서 저장하고, 상기 저장 수단은 또다른 오퍼랜드 데이터의 최상위 비트들의 최하위 비트들(lmsb)을 상기 목적지 레지스터의 최하위 비트들로서 저장하고, 상기 저장 수단은 상기 제 2 오퍼랜드 데이터의 최상위 비트들의 최하위 비트들(lmsb)을 상기 목적지 레지스터의 다음 최하위 비트들로서 저장하는, 컴퓨터 시스템. Wherein the processor is then the top of a storage means, the storage means is the destination of the most significant bit of the addition the most significant bit of the other operand data register for storing the most significant bits (mmsb) ​​of the most significant bits as the most significant bit of the destination register stored as bits, said storage means also stores the least significant bits of the most significant bits of another operand data (lmsb) as the least significant bits of the destination register, and wherein the storage means is the second least significant bits of the most significant bit of the operand data the computer system that stores the (lmsb) as the next least significant bits of the destination register. 상기 프로세서는 상기 최하위 비트들의 최상위 비트들(mlsb)을 상기 목적지 레지스터의 최상위 비트들로서 저장하는 저장수단을 포함하고, 상기 저장 수단은또다른 오퍼랜드 데이터의 최하위 비트들의 최상위 비트들을 상기 목적지 레지스터의 다음 최상위 비트들로서 저장하고, 상기 저장 수단은 상기 또다른 오퍼랜드 데이터의 최하위 비트들의 최하위 비트들(llsb)을 상기 목적지 레지스터의 최하위 비트들로서 저장하고, 상기 저장 수단은 상기 제 2 오퍼랜드 데이터의 최하위 비트들의 최하위 비트들(llsb)을 상기 목적지 레지스터의 다음 최하위 비트들로서 저장하는, 컴퓨터 시스템. Wherein the processor is next most significant of the most significant bit of the least significant bits comprising the (mlsb) storage means for storing as the most significant bit of the destination register, and wherein the storage means is the destination of the most significant bit of the least significant bits of further operand data register stored as bits, the storage means is the addition store the least significant bits of the least significant bit (llsb) of the other operand data as the least significant bits of the destination register, and wherein the storage means is the least significant bit of the second least significant bit of the operand data the computer system that stores the (llsb) as the next least significant bits of the destination register. 상기 프로세서는 상기 최하위 비트들을 상기 목적지 레지스터의 최하위 비트들로서 저장하는 저장수단을 포함하고, 상기 저장 수단은 또다른 오퍼랜드 데이터의 최하위 비트들을 상기 목적지 레지스터의 다음 최하위 비트들로서 저장하고, 상기 저장 수단은 상기 목적지 레지스터의 최상위 비트들을 미리 특정 비트 값들로 저장하는, 컴퓨터 시스템. Wherein the processor includes storage means for storing as the least significant bits of the destination register of the least significant bits, the storage means also stores a least significant bit of the other operand data as the next least significant bits of the destination register, and the storage means is the the computer system for storing the most significant bits of the destination register in advance to a specific bit values. 상기 제 2 오퍼랜드 데이터는 오디오 처리 및 비디오 처리 중 적어도 하나에 사용하기 위한 복수의 신호 값들을 포함하는, 컴퓨터 시스템. The second operand data, the computer system including a plurality of signal values ​​for use in at least one of audio processing and video processing. 상기 컴퓨터 시스템은 반도체 기판 상에 집적되는, 컴퓨터 시스템. The computer system, the computer system is integrated on a semiconductor substrate. 상기 프로세서가 상기 제 1 및 제 2 명령을 실행하도록 배열되어서 상기 제 1 및 제 2 명령에 특정 조건이 각각 달성되었는지에 의존하여 상기 컴퓨터 시스템의 프로그래머 가시 상태에 대한 상기 제 1 및 제 2 명령의 실행이 실행되거나 또는 실행되지 않는, 컴퓨터 시스템. Wherein the processor is running in the first and second command for be arranged to execute the first and second instruction, depending on whether achieve a certain condition on the first and second command respectively, the programmer visible state of the computer system It does not run or runs, the computer system. FR2693287B1 (en) * 1992-07-03 1994-09-09 Sgs Thomson Microelectronics A method for performing numerical calculations and arithmetic unit for Óoeuvre formatting method.